I've received commentary in the past about the issue with including onions and garlic in my recipes, as they are deemed inappropriate for an Ayurvedic diet. It's such an interesting arm of this life and food philosophy, that I thought I'd talk a bit about it! ~ the first step (for a healthy mind and body via thorough digestion and elimination) is to eat a primarily sattvic (pure, fresh) diet, avoiding rajasic (fiery) and tamasic (spoiled) foods in the main. Sattvic foods are fresh and light and help clear the mind. Energetically, rajasic foods stimulate more fire, aggression, passion. They are good foods for stirring up trouble or spurring on the dragons within." In general, to eat foods that are rajasic in nature will take you further away from a clear brain and calm spirit -- in effect, further away from the goal of enlightenment -- and cause your energy to be more emotional, unpredictable and fiery. "A bit of these foods can be used in meals with little ill effect and good enhancement of flavor. A couple of cloves of garlic per week, for example, would not be considered overboard at all by most Ayurvedic physicians. Avocados can be an excellent warming and grounding food... If, however, you live on coffee, chilis, ketchup, or sugar, you may want to look again at how you eat. It is possible your "contentious factor" is high." As well, there are other health benefits to some of these, for example pickles and fermented foods from a Macrobiotic perspective, or the pH-balancing nature of lemons and limes. These three sisters are properties, found in our minds, in our energy, in our food. They are all necessary elements in life, but like all things, need to be kept in balance. Sattva is that which makes us curious, thoughtful, and alert. Therefore sattvic foods help us embody these qualities. There seems to be no down-side to having too much sattva in our system! Sattvic foods include fresh vegetables and fruits, freshly cooked grains and beans, fresh-made yogurt, and nuts, seeds and natural cold-pressed oils. Rajas makes us active, giving us the desire to work, push, and manifest. In this way, rajasic foods are invigorating and mentally stimulating. An excess of rajas can make a person too competitive, both inwardly and towards others. Tamas gives us the desire to stop, slow down, and rest. A diet with excess tamasic foods turn us into a couch potato at best, and increase inner darkness, confusion and depression at worst. Tamasic foods include fast food, fried foods, frozen foods, microwaved foods, process foods, condiments, leftovers, alcohol, drugs, chemicals, onions, mushrooms, margarine, meat, fish and poultry, and anything old, spoiled or rancid. Our modern food culture has got us eating inordinate amounts of rajasic and tamasic foods, like ketchup, burgers, french fries, frozen dinners, nuked and processed foods, with very little fresh ingredients anymore (please, Slow Food Movement, stay alive!). From an Ayurvedic perspective, there is a very obvious parallel between how we are eating, and how we are acting, with our higher than ever levels of violence, crime, war and depression. I believe following these guidelines can make good (sattvic) food our medicine, to help heal not only our bodies, but our civilization as well. Thank you for sending me this post. It was very insightful. I too had read that onions and garlic were not used in Ayurvedic cooking, but then I consulted Amadea Morningstar's book, The Ayurvedic Cookbook, and in it she lists recipes using these ingredients and even goes on to state their benefits! I'm glad to see there is no absolute hard line on them, cause as you've read in my blog, it has been quite challenging to take them out of my diet. I love the article and especially I do agree with its conclusion! I love that you have shedded some light on the subject. In my yogi circle, there are so many people who swear off Garlic because they heard and learned that Garlic is devilish spice. If they consume it, they will never reach samadhi. Much like Ameet, I too also found many Ayurvedic recipes that call for Garlic and list their benefits. I have personally experienced that if one eats too much garlic, as in you know 2-4 tablespoon 3-4 times a day in their meal, it will make the mind more agitated. However I don't think there are too many people out in the world who eat garlic that much. I wonder why Garlic so misunderstood in the Yoga community? because of its theekshna and rooksha properties. 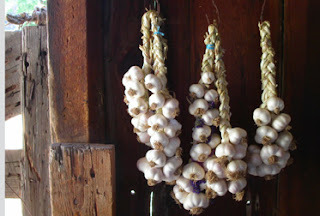 The maximum amount of garlic one should take a day is 6-7 cloves,not more than that.